On the left is Sarah Kahl, D.M.A., and on the right is the star of the recital, Robin Hasenpflug. 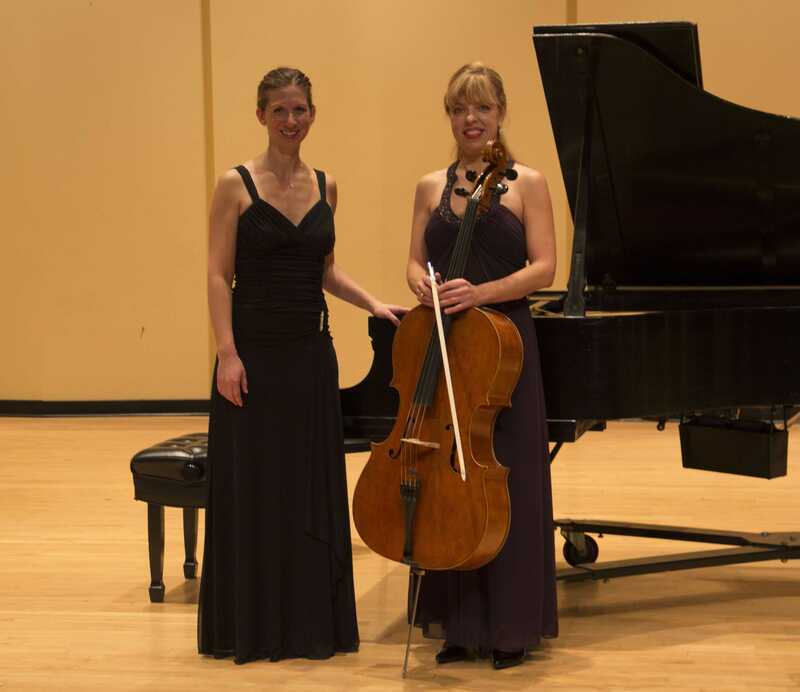 Robin Hasenpflug’s recital was a delightful mix of 19th and 20th century composers, whose pieces were interpreted with a sensitive and sophisticated artistry by Hasenpflug, as well as her accompanist, Sarah Kahl, D.M.A. The cello arrangement of de Falla’s piece had the interesting addition of the cello playing part of the accompaniment during interludes and postludes. The rhythmic pizzicato of the cello added to the piano very nicely and really brought out the flavor of the Spanish style. Hasenpflug’s artistry and interpretation of the Spanish text through the melodic line was exemplary, particularly in her performance of “Nana,” the fifth song in the set. “Nana” is a traditional lullaby with a two against three pattern between the vocal line and the gentle, rocking, piano accompaniment. Hasenpflug’s control of the cello allowed her instrument to sing this tender melody as if it was a human voice, with a rich, full legato tone as beautiful as one of the great vocal interpreters of this set, the Spanish mezzo soprano Teresa Berganza. Hasenpflug and Kahl gently began together the lyrical first half of Schumann’s work with a beautiful balance between the two instruments. As the adagio progressed, Hasenpflug and Kahl began to engage in a musical conversation back and forth consisting of short melodic phrases between the two instruments, and both performers played through this endearing section of the piece with grace and charm. Kahl supported and built up Hasenpflug’s melodic line as it grew in size, sound and passion, only to come down gently at the end of the adagio with a delicate sequence on the keys as Hasenpflug held out the last note. The allegro section of Schumann’s “Adagio und Allegro” does not prepare its listener for its abrupt and dramatic change of mood, and neither Hasenpflug nor Kahl held back as they dove headfirst together into this exuberant and passionate section of Schumann’s work. The contrasting sections of this piece are a fascinating look at Schumann’s personality, and Hasenpflug brought both the dreamy, introspective mood and the fiery, passionate mood of Schumann to life. Hasenpflug closed her recital with an exciting finish as she performed the French Romantic composer César Franck’s “Sonata in A Major.” “Sonata in A Major” is yet another transcription for cello – Franck’s original piece was written for violin. Hasenpflug introduced her audience to Franck’s gorgeous work with the winsome first movement, the “Allegretto ben Moderato,” which consisted of a wistful melody for the cello as the piano accompaniment varied from sweet, honeylike thirds to strong, heavy block chords in the lower register of the piano. The second movement, the Allegro, began with a long, fast and exciting piano introduction from Kahl, which set up Hasenpflug’s sequential, rising cello melody, which, in the true style of Romanticism, seemed to constantly struggle upward throughout the movement until breaking into a lyrical section full of yearning. The movement ended with a sparkling finish consisting of tense, rapid notes from both cellist and pianist as the piece raced toward its triumphant climax. 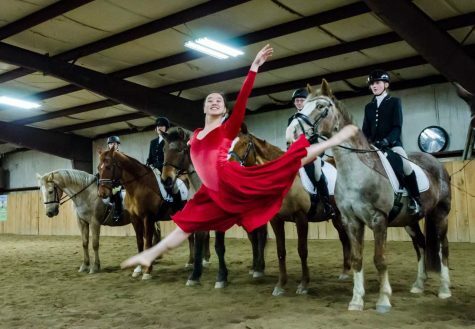 “The Fantasia,” the third movement, began with a passionate, sweeping melody in minor. Hasenpflug paid careful attention to phrasing in this movement as her lines seemed to both sigh and sob heart–wrenchingly as she played. After reaching its climax, Hasenpflug brought the melody down gently, pianissimo, to its close at the end of the movement while Kahl played soft arpeggios on the piano. The last movement, “Allegretto poco mosso,” began with an enchanting musical duet in major between Hasenpflug and Kahl that grew in intensity as the movement progressed. The “Allegretto poco mosso” ends with a long cadence, during which Hasenpflug and Kahl had their audience on the edge of their seats in anticipation after the excitement of this exhilarating last movement.